It's NATIONAL POETRY MONTH! Hooray!! 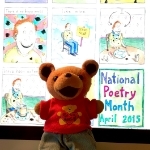 Kids LOVE poetry (and so do I)! Let's celebrate! Do you know about the mysterious book sculptor who donates her art with little notes "In support of Libraries, Books, Words and Ideas" (and other things, from "writers" to "all things magic"? She's been anonymously creating these works of art for four years and is now getting ready for one final creation... and she's inviting us to play along by making butterflies and sending them in! Have you ever seen a Little Free Library along the roadside? Did you know that you can start one in your neighborhood? Since childhood, I have been fascinated with the wonder of books. My parents deserve all the credit for this. I remember my little hand enveloped in my father’s big one as we took our weekly trek to the local library. This is where I learned to borrow what now has accumulated into mountains of books in my lifetime. Little Bear (with a little help from his friends) hosted a special event in South Florida at the Stirling Road Library in Hollywood! We had some scheduled readers, and everyone there was invited to read and also welcome to simply listen and enjoy. Judy Cooper, the “fun art professor,” attended and joined in the reading, as well as parents, grandparents, kids, and even Little Bear.